Digital download cover art including clone stamp. 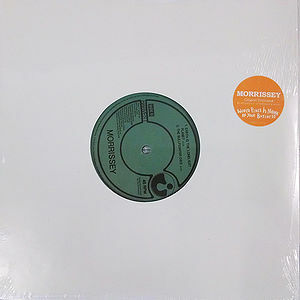 Earth Is The Loneliest Planet was the third single released off Morrissey's tenth solo album, World Peace Is None Of Your Business. The song was produced by Joe Chiccarelli and co-written by Gustavo Manzur. 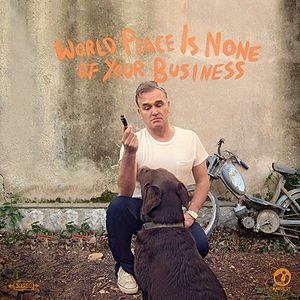 Morrissey began the recording of World Peace Is None Of Your Business on 1 February 2014 in France with producer Joe Chiccarelli. On 7 March 2014 it was announced that the forthcoming album was finished and provisionally set for a late June/early July release through the Harvest Records label. Earth Is The Loneliest Planet was released as a digital single on 04 June 2014. It was included on a limited edition 4-track white label 10" EP released 07 July 2014. Earth is the loneliest planet of all earth is the loneliest planet of all day after day you say “one day” day after day you say “one day” but there's always a reason why you're refused they always blame you, you, you and there is nothing anyone can do. ↑ www.thesmithschile.cl. (2014-07-01). "World Peace Is None Your Business" [10 Inch Vinyl Indie Exclusive] 4 track EP released (July 7, 2014). Morrissey-solo. Retrieved from morrissey-solo.com. This page was last modified on 13 January 2015, at 17:49.